Baltimore County Emergency Management officials are preparing for Hurricane Florence to bring heavy rains and serious inland and/or coastal flooding to the Baltimore area. The potential for flooding and for trees to topple and bring down power lines is greater because the ground is already saturated from months of above-average rainfall. Residents should prepare now to get along for seven days without power, said Baltimore County Fire Department Division Chief Jay Ringgold, who oversees the Office of Homeland Security and Emergency Management. Local emergency management officials participated Tuesday morning in the National Weather Service’s telephone update on the Florence forecast. 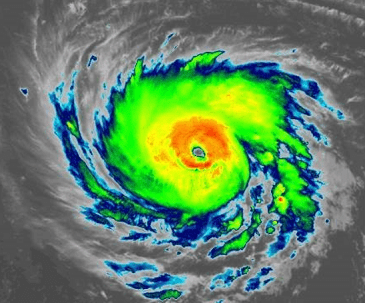 Forecasters are increasingly confident that Florence – now a Category 4 storm – will make landfall in the Carolinas, probably late Thursday. The storm is expected to be at least a Category 3 at landfall, with significant storm surge. Forecasters are less certain where the storm will track and how fast it will move once it moves inland. As of Tuesday morning, forecasters expect the Baltimore area to feel the first effects from the storm late on Thursday. The NWS believes the storm will stall, dumping heavy rains. The storm’s wind speeds, once it moves inland, are difficult to predict. The amount of wind depends on where and how quickly (or slowly) it moves. Because the storm is expected to stall and produce heavy rains, inland and coastal flooding are major threats throughout the south and the Mid-Atlantic. In some areas, flooding could be historic and catastrophic. The emergency situation from Hurricane Florence is exacerbated because the ground is already saturated. Trees are expected to fall, especially in areas that experience heavy wind, causing power outages and posing at threat to life and property. Baltimore County emergency managers will continue to receive regular updates throughout this weather event. Officials say every household should prepare for this weather emergency as soon as possible. Residents should consider how they will manage if the power goes out for an extended period. Locate and purchase supplies. Residents need non-perishable food, a manual can opener, medications, supplies for infants and vulnerable adults, pet supplies, flashlights/batteries and a battery-powered radio. Buy or store extra water – at least a gallon per person, per day, plus extra for pets. Fully charge all of your electronic devices. If power goes out, use them sparingly to make them last as long as possible. Get cash. ATMs will not work during a power outage, so visit one now. Assist vulnerable family, neighbors with storm preparations. This is critical; many vulnerable people, including older people cannot prepare by themselves. Inspecting swift-water and high-water rescue equipment; pumps and other apparatus. As Hurricane Florence moves closer to the east coast, the Maryland Department of Transportation State Highway Administration (MDOT SHA) is deploying maintenance forces throughout the state to begin preparations for the storm and its impacts. MDOT SHA crews will inspect, clean and clear storm water ditches, drains and inlets to ensure adequate drainage. Crews from MDOT SHA maintenance facilities are also evaluating all emergency response equipment such as high water signs, chain saws, chippers, loaders and grading trucks. Additionally, crews are ensuring that all generators are fully topped off and functional in case of power outages. Generators will keep maintenance shop operational, especially the fuel pumps, to keep crews in continual response mode. Motorists are encouraged to monitor the weather conditions, and if possible, avoid driving in any hazardous conditions. • Remain alert for wild animals, such as deer, that may flee dangerous areas and cross roadways. In additional to high-water, the approaching storm could result in scattered power outages. MDOT SHA reminds motorists that if you encounter an intersection where traffic signals are without power, treat all directions of the intersection as a four-way stop. SHA also advises motorists to stay aware of the forecast and, should heavy rain and high wind begin to affect the area, curtail travel as much as possible.